The long awaited Andrew Reynolds Cash on Demand 2.0 course was this week launched. The course, which is a complete update of the original Andrew Reynolds Cash on Demand course, which became the UK’s best-selling Home Based Business training course and features not what worked15 years ago when Andrew started his business in his spare room – but instead, the course features what he uses today to make a lot of money and which anyone can follow. Andrew Reynolds Cash on Demand 2.0 is a simple step by step Module based training course which takes students with no past experience in running this type of business, through the whole business model so that they can copy Andrew Reynolds Cash on Demand 2.0 system for themselves, allowing them to start and build their own sustainable business at home. The Andrew Reynolds Cash on Demand 2.0 course is offered with a free 30 day trial. In the package that you get when you apply for the Andrew Reynolds Cash on Demand 2.0 free trial – you get full length DVDs. One of these DVDs was filmed live at the sold out Entrepreneurs Bootcamp event that Andrew held to raise money for charity. You’ll see students of Andrew Reynolds Cash on Demand 2.0 course being shown how to make money, and more importantly what to do with it as Andrew takes you through some interesting charity projects that he is involved in. The second DVD that comes with the free trial of Andrew Reynolds Cash on Demand 2.0 is in fact filed in the townships of South Africa and features an update on previous footage that has been available to students of Andrew Reynolds Cash on Demand course before. On this DVD we see Andrew returning to the townships to see how the money he invested with local township residents has been spent and how it is making a difference to these communities. 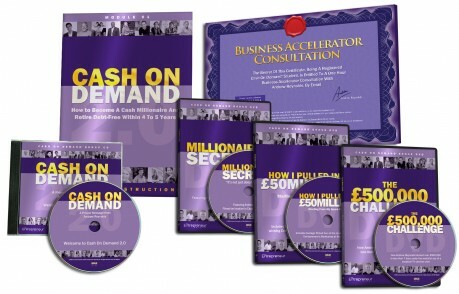 Hi I recently ready the cash on demand 2.0 book & then paid the postage to receive the DVDs etc & I’m more than ready & raring to go & get started. I’m just not sure what to do from here. Please can you advise me on the next step & what I need to do. I eagerly await your reply.